Project Info: I created this layout as part of a Challenge using a Page Maps sketch. I created a journal box in Word so that my text would wrap around the Life’s Music vellum title piece. I then punched the bottom of the journaling piece with a spiral punch and inked the edges with Mocha Mama PowderPuff Chalking Ink. The journaling reads: It’s hard to imagine being married for 70 years. Not many make it that far. Grandma Sodowsky is 88 years old and Grandpa Sodowsky just turned 90 this year. How things have changed during their lifetime. We celebrated their 70th wedding anniversary at the Marland Mansion. Grandpa enjoyed telling stories of his past to anyone who would listen and Grandma fussed over her hair and didn’t want her picture taken. Times have changed, but this is so typical of the both of them. July 2009. 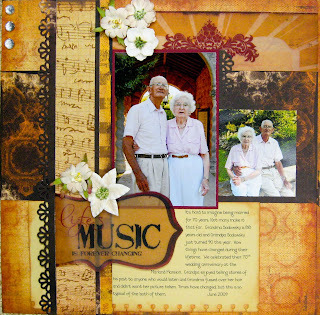 Greetings here from Theresa and I have another Canvas Kit Creation to share with you all! Boy these are addicting! I was a bit intimidated the first time I tried one of these but now I always look forward to seeing what the new Canvas kit is each month! I used the November Club Q Canvas Kit for my “Time” canvas. I also added some extra elements to my project from some of the other November kits. First I painted the edges of my canvas with some black acrylic paint and used some Copper Brown Metallic Rub On paint to my black cardstock borders. Banners are very popular right now so what a perfect addition to the November kit. I added an extra layer to my canvas when I fussy cut a piece of my Copper Kettle QQ paper and pop dotted it to give it some dimension. I inked everything with QQ Powderpuff Chalk Ink in Mocha Mama and Midnight Confessions. I also added one of the Velum flowers from one of the other November QQ Club Q kit, added a clock rub-on with one of our Big Brads and also a couple of clocks from the October Club Q Teresa Collins Kit. Added a bit of bling and that’s it. I hope you enjoyed this and check back on Tuesday where I’ll have a great technique to share with you on how I added the glitter to my “TIME” banner. You won’t want to miss it, So Fun and Super easy! See you there! Take Care, Theresa! Jen and Theresa, these are stunning! With the addition of this new Copper Kettle collection, I can't decide which collection I like most. They are all beautiful and so different from one another. Both projects are beautiful and inspiring. I am in Christmas mode now though. I'm wondering if QQ is coming out with something new and wonderful for the holidays this year.